PE0273. YES, UNCLE! (Clifford Grey & Nat D. Ayer), recorded 1917-18, w.Albert Ketelby Cond. 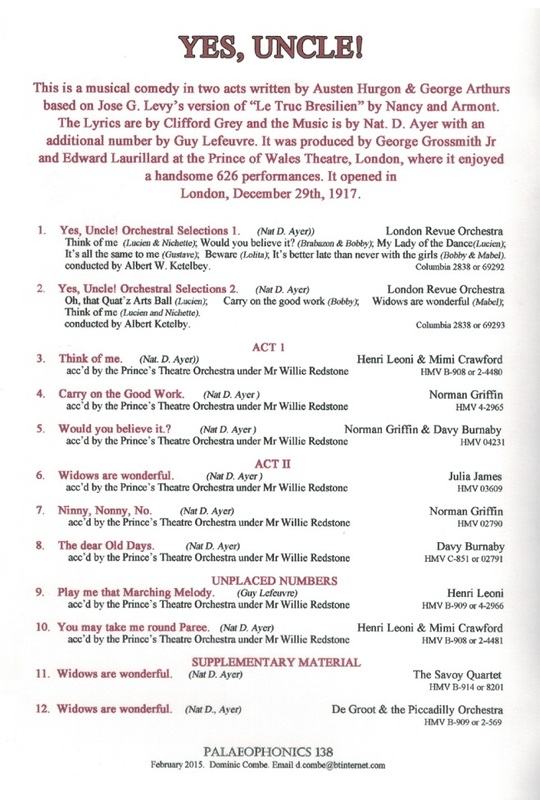 Prince's Theatre Ensemble; Henri Leoni, Mimi Crawford, Norman Griffin, Davy Burnsby & Julia James; Additional material by The Savoy Quartet & De Groot Cond. Piccadilly Orch. (England) Palaeophonics 138, w.Elaborate ‘The Play’ 18pp. Brochure replete with numerous photos of the Prince of Wales Theatre 1917 production & biographies. Excellently transferred from the legendary Acoustic 78rpm HMV rarities. NB: Dominic Combe has recently located a far superior 78rpm pressing of the irrepressible 'Widows are wonderful', now replacing the earlier version on this CD. Anyone who purchased this in the past may have, at no charge, this replacement CD. The lyrics are by Clifford Grey with music by Nat. D. Ayer with an additional number by Guy Lefeuvre (not in the album). It was produced by George Grossmith and Edward Laurillard at the Prince of Wales Theatre, London, and ran for 626 performances. “YES, UNCLE! is a musical comedy by Austen Hurgen and George Arthurs, with music by Nat D. Ayer and lyrics by Clifford Grey (who also wrote THE BING BOYS ARE HERE and the following series of highly successful reviews). The story is based on the farce LE TRUC DU BRÉSILIEN by Nicolas Nancey and Paul Armont, and the musical takes its title from the catch-phrase used by Bobby Summers and Mabel Mannering, addressing Uncle Brabazon Hollybone. It was produced by George Grossmith, Jr. and Edward Laurillard and opened at the Prince of Wales Theatre in London on 16 December 1917 and ran for a very successful 626 performances. The piece starred Fred Leslie as G.B. Stark, Margaret Bannerman as Joan and Leslie Henson as Bobby Summers. Later, Madge Elliott and Cyril Ritchard starred in the musical. 'Widows are wonderful You must admit they’re wise They’ve got the eyes Always hand you some surprise Widows are marvellous, They’ve got that kind of way. If they’re short or tall, the men are bound to fall, that’s all. Widows are dangerous, They’ve had experience. There’s just so many turtle doves, Single girls are much to tame, But a merry little widow knows the game. She’s beautiful, She’s marvellous. It’s the wonderful way she loves. Some boys go to college, And some to public school. They cram themselves with knowledge, But still they’re mostly fools. Girls are prepossessing, They may be sweet and fair, But a widow keeps you guessing And she gets right there. Widows are wonderful You must admit they’re wise They’ve got the eyes Always hand you some surprise Widows are marvellous, They’ve got that kind of way. If they’re short or tall, the men are bound to fall, that’s all. Widows are dangerous, They’ve had experience. There’s just so many turtle doves, She’s beautiful, She’s marvellous. It’s the wonderful way she loves'.